AMD Rewards RAISE THE GAME – 3x Game Bonus! 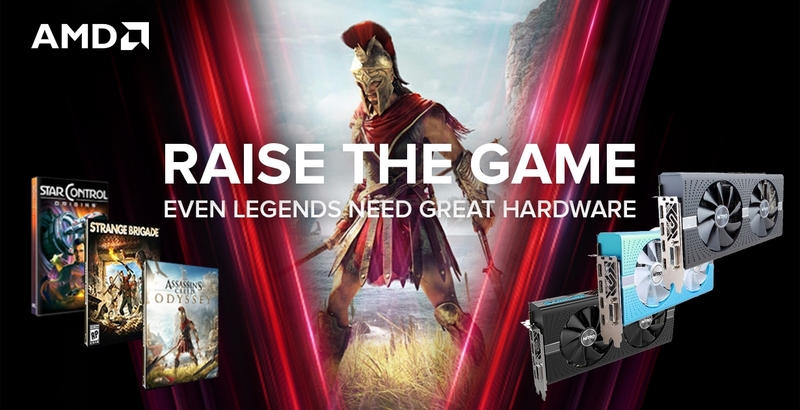 This Promotion has now ended, see the latest AMD Rewards here! For a limited time and while stocks last, get yourself a new RX 570 or RX 580 Graphics Card, or a Custom Gaming PC featuring this hardware, and you can register to redeem a special AMD Reward code that will unlock a 3x Games BONUS! The games included in this promotion are pretty legendary indeed, with Strange Brigade, Star Control and Assassin’s Creed: Odyssey up for grabs. All yet to release! Starting off with a closer look at Strange Brigade! This one is a 4 player co-op adventure set in a 1930’s Indiana Jones meets the Mummy style adventure (from what we’ve seen so far at least). Explore alone or team up in 2-4 player online co-op, travel the ancient world as one of four dashing agents trained to tackle the supernatural. Seteki is not the only mythological menace to have awoken though, she’s brought an army of loyal beasts with her! Explore remarkable ruins, solve perilous puzzles and uncover tantalising treasure while blasting your way through an array of undead enemies in thrilling third-person action that’s certain to bring out your inner adventurer. Hunt the foul Seteki through a rip-roaring campaign filled with dangerous dig sites, prodigious pyramids and crumbling caves packed with bountiful foes to send back to the afterlife. Decapitate the undead with spinning blades, fry them to a crisp with fire traps, crush them with a well-placed boulder and more. Keep those peepers peeled for suspicious clues, secret entrances and ancient contraptions that need re-awakening! Who knows what alluring treasures and buried riches await you on the other side. Next up is the latest version of a game that many will likely have fond memories of from the original release in 1990 – Star Control is back!! This latest version is called Star Control: Origins. You are the Captain of Earth’s very first interstellar ship – Congratulations! There’s just one tiny problem. It’s barely worth mentioning but a powerful alien species known as the Scryve want to exterminate humanity. We need you to go out and find allies, upgrade your ship and save the universe! Discover and use these so-called Precursor relics to upgrade your ship and try to avoid getting eaten along the way so that you can save humanity. The next one is sure to have us running, jumping, slicing and dicing around Greece in Assassin’s Creed Odyssey! This latest story in the Assassin’s Creed saga carries us into the biggest war so far. Demonstrate your warrior’s abilities in large-scale battles between Athens and Sparta featuring hundreds of soldiers, or ram and cleave your way through entire fleets in naval battles across the Aegean Sea. Your decisions will impact how your odyssey unfolds, with multiple endings thanks to the new dialogue system working with the choices you make. Customize your gear, ship, and special abilities to become a legend in new environments including lush vibrant forests, volcanic islands and bustling cities. This promotion is now live! This is a register to redeem promotion available now at PB Tech New Zealand, check out the full range of RX 570 or RX 580 Graphics Card and Custom Gaming PC included in this awesome promotion and get your games bonus today! 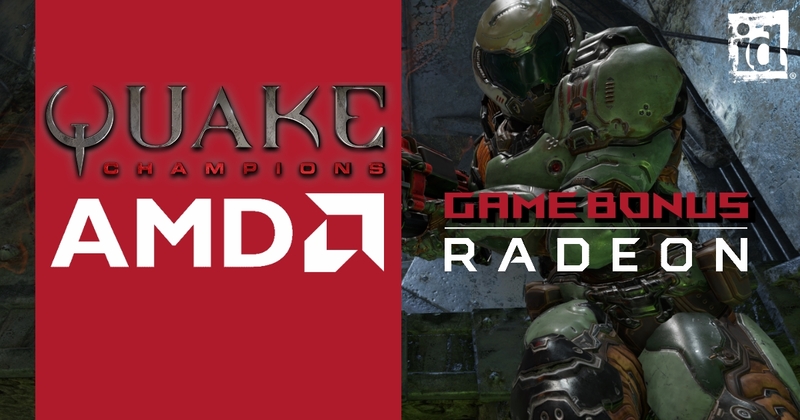 Gear up with AMD Ryzen 5, Ryzen 7 or RX 560, RX 570 or RX 580 then register to redeem to get early access to QUAKE CHAMPIONS and a sweet FREE BONUS, the “Champions Pack”. This awesome bonus is valid on purchases made between the 22nd of August 2017 and 29th of October 2017 so get in quick! This is a register to redeem promotion, with two different ways to get your code depending on if you purchase an AMD RX Graphics Card or Ryzen CPU, so once you’ve geared up with your new hardware simply visit the websites below and follow the steps along. Packed with blazing-fast action and explosive rocket jumps you know and love, step into the arena with Quake Champions and access your arsenal of powerful and unique weapons. There are no loadouts, and no limit to the number of guns you can carry, just pure VS action!